Welcome to Miss Hilda's Cross Country Tour! 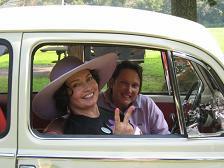 As you know, Miss Hilda is my 1966 VW Bug.....I’m just the driver. Yes, we're driving cross-country! As the Simon and Garfunkel song says ---- we've gone to look for America. And it's all about the road less taken. Where is Miss Hilda today? WE MADE IT!!!! AFTER 4,500 MILES MISS HILDA ARRIVED IN SANTA BARBARA! The Little Bug that Could!! From Lancaster County, PA to Santa Barbara, CA. NO seatbelts, air-conditioning, radio, power brakes, airbags...and an air cooled engine that ran on a 6 Volt battery with maximum power of 50hp! Wow! A few weeks ago we were in Eldon, Iowa at the iconic house featured in American Gothic. And, as you can see, we've created a NEW American Gothic. Starting out in early morning, we began crossing the California section of the Mojave Desert. And what an exotic and evocative name: Mojave. Named for the Mohave tribe of Native Americans, this vast and stark desert covers well over 22,000 sq miles. Yes, the Mojave has the raw, unique and serene beauty that its name conjures. Canyons, painted rocks, bordering mountian ranges, etc. You'll want to have your camera ready at all times. 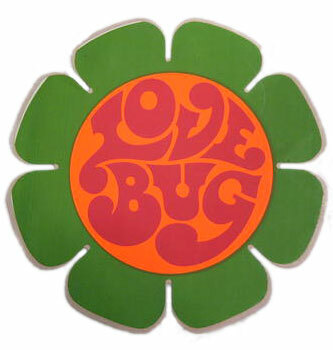 But, because I was driving Miss Hilda, a 1966 VW Bug, we were most affected by the unrelenting and whistling wind! Wow! We were getting battered and pushed around by the Majove wind, so we had to putt-putt across this desert with the windows CLOSED. Yep, you guessed it: no air conditioning. Not ideal. Miss Hilda quickly became my personal, rolling sweat lodge. But I was encouraged to see several large wind farms taking advantage of this incredible natural resource! After a few intensely close calls with overly aggressive traffic on two California freeways -- what was I thinking?? 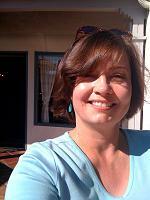 -- Miss Hilda arrived in sunbathed and palm-lined Santa Barbara! Surely, Santa Barbara is the Land of Oz for vintage VW Bugs. You see them all the time - still loved and running. It was a bit hard to believe we'd arrived at our final destination. We'd travelled over 4,500 miles to explore the natural wonders, local museums, history, regional traditions, eccentric characters and unique culinary tastes throughout this great country of ours. We'd explored the rich texture of our American roots - and got a brief glimpse of the future of this great country. I'd driven Miss Hilda through snowstorms in numbing cold, thunderstorms, sleetstorms, blazing dessert heat, never-ending midwest wheat fields and up 10,000 ft mountains. Which we very slowly descended. And now we'd reached our final destination. But Miss Hilda never let us down. She always started quickly and ran true. Incredible. I couldn't have done it without Bob's constant support during the trip. He became the official navigator & photographer and his help was crucial. And thank you, dear family and friends for your love & support. You all were with me on this trip! My final perspective: as Mr. Guthrie says, "This land is YOUR land, this land is my land." Now get out there and see it! From Lancaster County, PA to Santa Barbara, CA. A great American road trip. Crazy, I know, but it’s been my dream. We're proudly letting our inner Freak Flag Fly! Miss Hilda’s cross-country trip would be nearly impossible without my beautiful husband, Bob, as our Official Road Crew! I know it’ll be tough. Miss Hilda doesn't have seatbelts, air-conditioning, a radio, power brakes, airbags, etc. And don't forget that Miss Hilda runs on an air-cooled engine. But every journey has its challenges! Want to send a message to us? Just click the Your Feedback button, on the left side of this page and scroll to the bottom! Or send an email to misshilda1966@yahoo.com and we'll do our best to post it. We'd love to hear from you. We’re going to take a slow ride across the USA to explore, learn and just experience. Beautiful. Thanks for your love and support!!!!!!!!!! The long brown path before me leading wherever I choose." 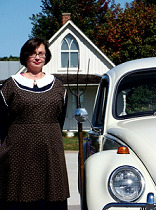 Miss Hilda is my 1966 VW Bug - I'm just the driver. And we're on a cross-country tour to discover America! Here are the message to Miss Hilda! Photos from the Wonderful Send-Off Party!!! 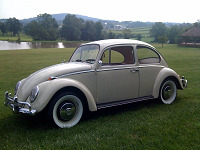 My 1966 VW Bug - Built for Speed! First Day of Miss Hilda's Cross-Country Tour ! Days 3 & 4 - Lima, Ohio - thru Indiana -- into Illinois! Illinois: Old Rte. 66, Home of the Corn Dog, Lincoln's Home & Museum, etc. Day 7 & 8 - Mississippi River, American Gothic, John Wayne & MORE! Amazing thunderstorm, wind farms and a rock-n-roll shrine! After 2,700+ miles, Miss Hilda, a 1966 VW Bug, Reaches Montana! Miss Hilda Crosses into California and Tackles Yosemite! Miss Hilda Reaches California, Tackles 10,000 ft Mountains and More! MISS HILDA FINISHES CROSS-COUNTRY TRIP! After 4,500+ miles, Miss Hilda makes it to Santa Barbara, CA!